Perhaps the most famous of all the machines built by Fritz Egli is the Egli Vincent, of which around 100 were produced between 1967 and 1972. Other notable models include Egli-Suzuki, Egli-Kawasaki and Egli-CBX1000. There were also frames for the Yamaha TZ series in various guises. Superb replicas of the Egli Vincent were manufactured in France by Patrick Godet, who died in 2018. 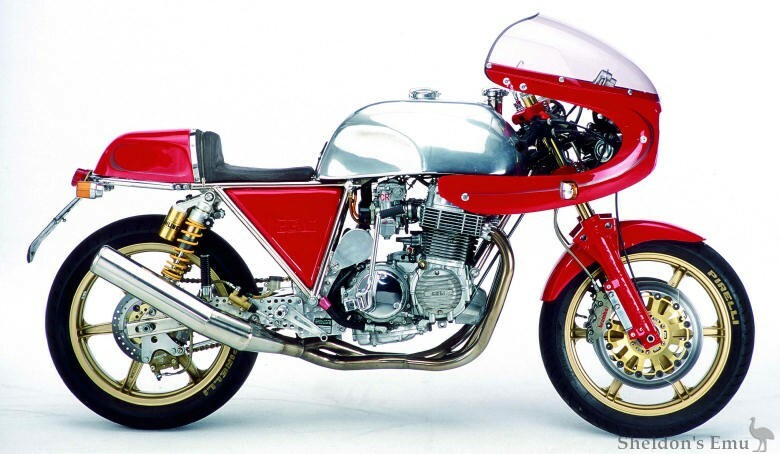 What year did Egli commence making the Red Baron? I need this info for our historic race rules because the cut off date for my CBX racer is 1982. Any replica parts must have been available prior to 1983. Dudley Lister here in Oz claims to have a red baron frame. He says, one of 3 of a "recent" production run. Is this possible? Was there a recent run of these frames? I would be very grateful if you could answer these questions please. Vincent Motorcycles: The Untold Story lists Egli CBX from 1979, which may well be correct. im Anhang findet Ihr die Vorab Information zum EGLI Treffen 2018 in der Schweiz vom 7.-9.September 2018. Damit erfolgt noch keine Anmeldung zum Treffen ! Diese ist erst nach dem Versenden der Einladung möglich. in the appendix you will find the preliminary information on the EGLI meeting 2018 in Switzerland from 7th - 9th September 2018. We kindly ask all interested parties to register by the 15th of September 2017: events at eglimotorcycles.com for further information. I have just seen the pictures of your bike on Shelddon´s EMU. I am the German importer of EGLI® motorcycles. I am sad to tell you that your frame is not an EGLI® frame. I think that your frame is a RAU frame. RAU copied the EGLI frames beginning in the late seventies. The swing arm looks like a Krüger & Junginger one. The Alloy tank seems to be a Rheinschluessel production. The carbs should be taken from a HONDA CB 750 F2. When I visited the 30th international EGLI meeting in August we stayed some more days in Switzerland this year. When we drove over the Furka we met some Spanish guys with DUCATI bikes. I was riding with my EGLI® DUCATI . These guys told me that they know someone in Barcelona who is working on an old special frame probably an EGLI® in Barcelona. I think they spoke of you. Many greetings to those guys. With this mail you get some pictures of EGLI bikes and a picture of the Furka when we met these Spanish guys. Hi!! I'm Ruben from Barcelona. 3 months ago I found a Honda 750 sohc standing in a backyard since 1985... I don't know which year is the engine, the serial number is B750GE-1007893, and the frame looks like an Egli, but I'm not sure. Can you help me please? I want to rebuild the bike but I don't have too much information. Front forks are Marzochi, wheels are DID, front brakes AP Lockheed, I don't know the carbs, rear shocks, swingarm... and the frame! I'm not sure if is an Egli or replica (Martin...). I bought an egli frame from a guy living france , it originally came with a sand cast cb750 engine with no numbers 1969 0r poss 1970 judging by the forks and carbs. The head stock has a number 2 with an arrow then below that H750 and below that 143 A.E. If any one can help with info this ,it would be greatas I am now starting to rebuild. you have a photo of my Egli Vincent asking for information. What can I tell you? I can't find it again either. I came across your site from a google image I saw of it. Here is a photo in case you come across it. I found the page that directed me to your email. I built it in 2002, frame was made by Fritz Egli, engine is 1952 Vincent with Lightning cams, 36mm Dellortors on ported heads, 10:1 compression. Quaiffe 5 speed gearbox. Ceriani road race forks, Laverda wheels (Grimeca brakes), Ohlins shocks. Owner fabricated alloy tank, seat, exhaust system, primary drive. Honda kick starter. 375 lbs wet. Dating / Authentic Egli ? three EGLI DUCATI´s nearly the same as my private EGLI DUCATI which shows the picture I have sent you. One of the new EGLI DUCATI´s is built up with a round case engine. You will find a picture of this in this mail. An EGLI SUZUKI with the old air cooled 1135 engine is built up here. Three MRD 1 ( EGLI KAWASAKI with a turbo charged engine ) are here to build up. T last I am restoring an EGLI VINCENT for myself. A lot of new spare parts are made here. For example the down tubes for The EGLI front fork with 38 mm, the development of a new adjustable damping system for the front fork, the rear sprockets, a lot of mounting plates for the engines, and lot of things more are my job. All bodywork parts made of carbon fibre come from here. Engine tuning is a job I do here too. A lot of people with DUCATI bevel driven engines, HONDA sohc fours, KAWASAKI Z 900-1100 are bing there engines or buy parts from here. I have nearly 1000 customers all over the world. 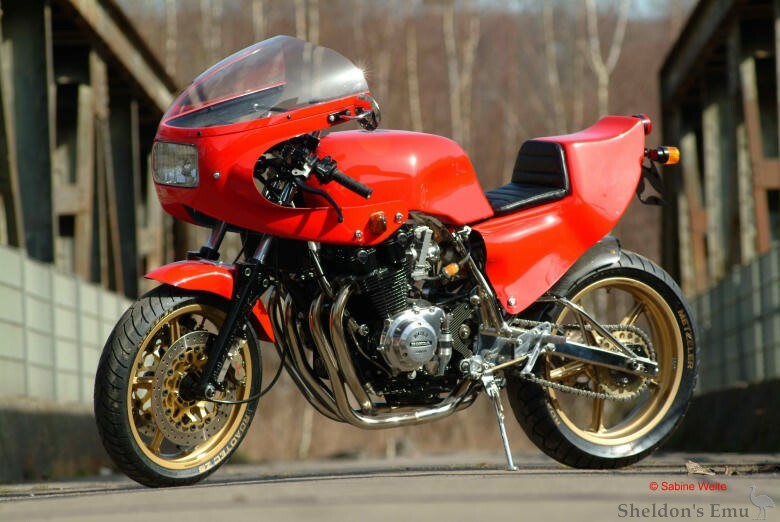 The earls EGLI DUCATI looks quite different from the bike which I have found on your page. The rear suspension was a conventional swing arm with one oval tube on each side and normal twin shocks. to the EGLI scene. From 1984-1986 I worked as a constructor direct in Bettwil. In the same year I started my company. The picture of my second EGLI HONDA shows the typical construction of an EGLI with twin shocks at the rear. Only the brakes and the use of ÖHLINS shocks are modern parts - but these parts are working really well! I also own a very rare EGLI KAWASKI with a 2 stroke triple engine. Only three or four frames of that type were built around 1970. If you need more information or more pictures you can contact me again. A book about EGLI was published in 2007. It shows a lot of bikes - not all. The language is in German and in English too. I can deliver it from here. On this site you get a lot of information about nearly every frame builder ho has worked with the HONDA 750 sohc engine. You will find a lot of interesting details of frame builders like Seely, Rickmann, Dresda, Martin Segoni and others mostly European ones.. Axel has also begun to built up a Seely register. The link leads you to the English site. 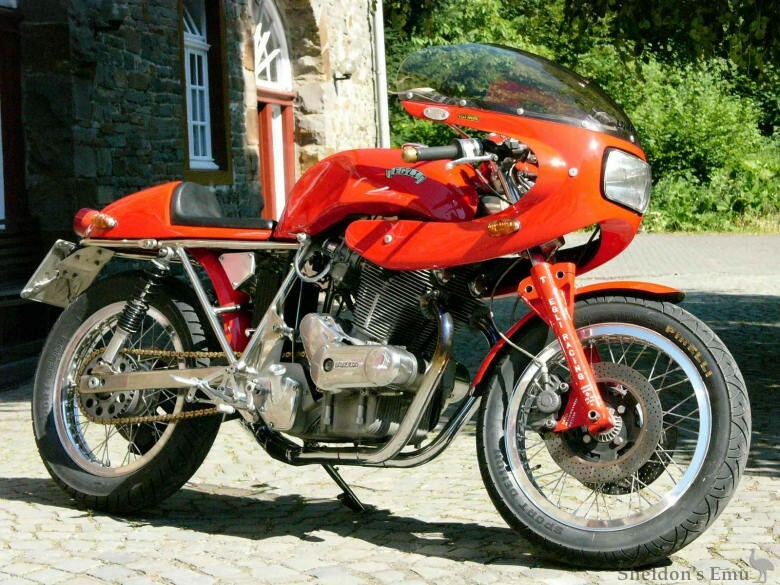 The pictures of this mail show an EGLI LAVERDA one of 11 which were originally produced and one the best EGLI HONDA Bol d´or 1100. I am the German importeur of EGLI Bikes. I also sell the parts for these bikes to customers all around the world. The EGLI DUCATI in the Your gallerie doesn´t show an EGLI! It has a quite different frame construction. With this mail I send you a picture of my EGLI DUCATI. As far as I'm aware frames and kits for those engines are no longer available. Ed. looking for fabricator for egli-framed buell engine. What is the current market value for an EGLI CBX in original condition? WANTED: EGLI CBX 1000 "RED BARON"
I am looking for a frame or complete Honda EGLI 6-Cylinder CBX1000 bike. Further I am looking for a Turbo Kit for a CBX1000. Is there anyone who knows where to find these kind of bike/parts ? Not familiar with such a make. There are several frame builders, of course, who built chassis for earlier Kawasaki engines, in particular the Z900 which were particularly evil handling in standard form. Which engine is it designed to take? I would like very much to purchase basic Egli style chassis for a Japanese inline 4 (Yamaha FJ). I don't beleive there a Egli chassis for this engine so I could use one from a Kawasaki are Suzuki. Cycle Guide magazine of April 1987 has a feature article on Fritz Egli and an Egli-Suzuki 1400. I have the chance to purchase an Egli Kawasaki from the 70's with the Pops Yoshimura engine but it has been hit in the rear by a car. The rear wheel is cracked and will need to be replaced. Were these wheels made by Egli or did they use Campagnola or some other wheel company. Any idea of the value of these machines when they are in good condition? Sorry I don't have the specific year. I am trying to figure out if it worth pursuing. I think some Eglis had the brand cast into the wheels, but it's more likely that he used a proprietory wheel - most of these also had the brand cast into them. Ed.